The word “maverick” is overused in the contemporary music world. But in the case of composer Michael Harrison and cellist Maya Beiser, the descriptor is deserved. While Harrison has made news headlines for such achievements as building a piano that can play 24 notes per octave (the usual number is 12) Beiser recently impressed New York audiences with Elsewhere, a multimedia “cello opera” about women’s suffering in which the musician supplemented her cello playing with spoken monologues amid a set strewn with white sheets and black gravel. 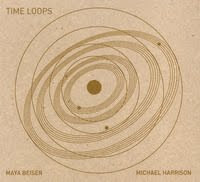 So it comes as a bit of a shock, in the middle of Harrison and Beiser’s new album, Time Loops, to hear this most musically experimental of duos giving a heartfelt, almost schmaltzy, rendition on piano and cello of the J. S. Bach/Charles Gounod Ave Maria. A staple of weddings, funerals and qinceañeras since the mid-19th century, Ave Maria appears upon first listening to be a strange addition to an album that otherwise mostly showcases Harrison’s inventive, melody-forward compositions written in “just intonation,” an esoteric form of tuning based on whole number proportions that went out of style with the arrival of the now ubiquitous “well-tempered” tuning, and Beiser’s careening, multi-textured playing. But upon closer inspection, the inclusion of Ave Maria makes sense. For one thing, it provides the inspiration for the album’s title track, in which the piano part of the Bach/Gounod piece is recorded and played backwards through a computer to eerie effect while the cello performs the original’s lush melody in retrograde. For another, Ave Maria, which cleverly superimposes a Romantic melody over a Baroque prelude written around 140 years earlier, beautifully symbolizes this album’s overall preoccupation with marrying the old and the new to ear-tingling effect. Just Ancient Loops, a kaleidoscopic, three-part meditation for cello, combines ancient scales and harmonies with contemporary looping techniques that make Beiser’s solo instrument sound like an orchestra. Meanwhile, Hijaz, a brilliantly schizophrenic work that veers between slow, lyrical passages and fast, rhythmic spasms, unites an aged Middle Eastern and North African mode with the youthful voices of the Young People’s Chorus of New York City. Because every track on the album is composed and performed in just intonation, the music sounds startlingly fresh. After all, even a chestnut like Ave Maria has maverick roots.